Because the nursery floor covers such a relatively large surface area, it is becoming widely accepted that any toxins emitted from the baby nursery flooring you choose can have a significant impact on baby's health. No matter how much you would like to keep things simple, once you know about these things and the effect they can have on your delicate newborn's system, you just cannot ignore them. 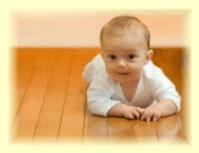 The Safest Organic Baby Nursery Flooring Materials. 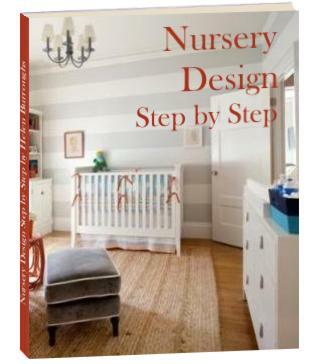 What To Look For In A New Nursery Carpet. Low or non-existent toxic emissions. An inability to harbor dirt and dust mites. Other than ceramics, stone or slate, which are way to cold and hard for baby, wood, cork, natural linoleum and bamboo meet these requirements. The following chart illustrates the benefits of each of these materials as an organic baby nursery floor covering. The disadvantages are also listed. To further avoid hazardous chemical emissions, ensure that your flooring of choice is stained at the factory. With the exception of the linseed odor, the disadvantages of these organic baby nursery floorings can be overcome quite easily by using an nursery rug in the baby room. Make sure to use a non-slip natural rubber pad beneath the rug to prevent dangerous wrinkles and sliding. Because the baby nursery is a low traffic area, you have a choice of hardwood, softwood or laminate. If you choose laminate flooring, make sure that it has not had formaldehyde added during the manufacturing process. Avoid cork-vinyl composites. (Cork with a PVC backing.) Rather choose tiles or sheets with a natural jute backing. Make sure that the cork has not had formaldehyde added during the manufacturing process. Due to increasing popularity, bamboo is now widely available across a broad price spectrum. Make sure that the bamboo has not had formaldehyde added during the manufacturing process. Some bamboo flooring contains glues and binders containing potentially harmful aldehydes. Look for a brand that does not contain these additives. Of the recommended organic baby nursery floorings, linoleum has the highest rate of emissions even though it is manufactured from natural substances. Some people are sensitive to these emissions. Linoleum also gives off the odor of linseed oil long after installation. Some people find this off-putting. If you decide to use one of these coverings for your organic baby nursery flooring you can rest assured that your baby will be exposed to only minimal VOC emissions and no dust mites. Which of the alternatives you choose will be a personal choice dependent upon the chosen style of your baby nursery and the decorating style in the rest of your home. My personal favorite would be cork, as it is cushioned and warm, possessing all the benefits of carpet without the dust mites. Should you decide that you would prefer carpet in your baby room, the next section shows you what you should be looking for. Purchase an organic baby nursery carpet made from natural fibers. Organically grown wool, cotton, hemp, jute, ramie or goat hair are sound options, as are sisal fiber, seagrass reed, coir, mountain grass and bamboo. Organic fibers are grown with no synthetic chemicals. Purchase baby room carpets made with undyed or vegetable dyed fibers. Synthetic dyes off-gas toxic substances. For the same reason, buy carpets without treatments, such as stain protectors and mothproofing. To avoid hazardous adhesives, choose a nursery carpet with natural rubber and jute backing. Purchase untreated wool or camel's hair felt pads rather than synthetic foams, foam rubber, latex, or plastic underlays that contain hazardous chemicals. Allow time and space for off-gassing for all newly purchased carpets. You can ask the company you purchase from to air the carpet out in its warehouse for at least three days before delivery. For at least 72 hours after installation, open windows to disperse VOCs. Before laying down new carpet, vacuum your floors, as well as, both sides of the new carpets and pads. Nail carpets down instead of gluing, or use water-based adhesives. To minimize the amount of dirt that gets trapped in the nursery carpet, cover it with a good size, natural fiber, washable nursery rug. Find out how to keep your new nursery carpet clean and safe here. 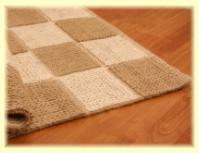 Natural fiber rugs are available in wool, cotton, sisal, jute and seagrass. No chemical treatments such as stain or moth protection. Whether you are planning to create a complete organic baby nursery, or you just want to reduce the level of toxins you newborn is exposed to, the nursery floor is one of the best places to start.